In this lesson students will use their senses to explore the world around them and the world depicted in the painting Grand Canyon of the Yellowstone. They will then have an opportunity to use this sensory information to write a creative piece and “perform” what they’ve written. use their bodies and voices to act out abstract written concepts. Warm-up: Take the students on a walk around the building, going outside if possible. Students need to write down everything they observe. When you return to the room, ask them to tally how many observations fall into each of the following categories: sight, sound, touch, smell, taste, movement, and/or balance. Ask which students had more visual observations than any other kind (most will raise their hands). Tell them that having more visual observations is normal, but that for the next activity you want them to work on using all of the other senses you listed. Share the painting Grand Canyon of the Yellowstone with students, enlarged to its actual size if possible. Have students write down free-flow ideas in a journal describing how the place depicted in the painting triggers all of the senses: sight, smell, sound, touch (including more than just the touch/texture sensed by their hands), smell, movement, and balance. The cues they need to address these elements are provided in the painting; their imaginations have to do the rest. Have them share their writings in small groups. Discuss why the painting is so effective at triggering sensory observations. Tape together pieces of butcher paper until you have one piece of paper that matches the actual size of the painting. Invite students to choose sections from their free-flow thoughts, determine which section of the painting triggered those thoughts, and write down their thoughts on the butcher paper in the same area of the painting that trigged their ideas. Then as a class, “perform” the written “painting” with students reading aloud different sections that appeal to them. Invite students to get creative for the performance. They can act out sections, sing, read from an animal’s perspective, etc. After looking closely at Greased Lightning, students will examine the unusual angle the artist chose. They will explore other images of horses and then try their hand at drawing what Leigh’s scene would look like from the opposite side. How Would a ___________ Move? 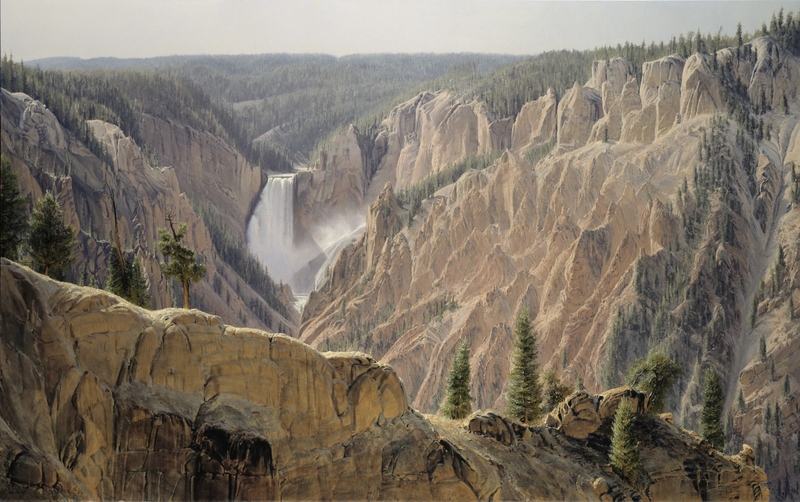 Children will explore and carefully examine Wilson Hurley’s Grand Canyon of the Yellowstone by imagining different animals moving around the painting. They will also think about and experiment with the sound of water, inspired by the waterfall portrayed in the painting. Students will examine how the composition of O’Keeffe’s Cow Licking influences their reaction to the painting. They will then draw upon what they learn to create a piece of their own. Students will look at William R. Leigh’s painting Greased Lightning and imagine stories that explain what might have startled the horse, then they will have the chance to act out their imagined stories. Born in Tulsa, Oklahoma, Wilson Hurley was interested in art from a very early age. His mother arranged for him to spend time in the studios of Santa Fe artists such as Theodore Van Soelen. He was also given flying lessons as a teenager and went on to attend West Point Military Academy. He arrived in the South Pacific just in time for the World War II victory celebration—instead of fighting, Hurley made landscape sketches from the cockpit of his airplane. When he returned to the States he practiced law for 13 years, then worked as a banker, and finally decided to devote himself to painting at the age of 40. He didn’t sell a painting for five years, so he made his living by flying planes for the New Mexico Air National Guard. Hurley credits his experience as a pilot with giving him a unique understanding of landscape. His artwork is informed by his extensive knowledge of geological, geographical, atmospheric, optical, and technological sciences involved in creating realistic landscapes. But it’s not all science: “We’re progressing into the technical blend—partially emotional, partly scientific. I don’t try to manufacture emotion, but I do try to remain sensitive to how I feel. There’s a tremendous sense of awe,” says Hurley. “What I’m painting does not have a story line. I am saying, look, look at the world that turns under the sun every day,” says Hurley. This particular part of the world, the Grand Canyon, is one of Yellowstone National Park’s greatest attractions. The canyon is about 10,000 years old, and over generations it has been molded and remolded by water, wind, and other natural forces. Erosion has deepened and widened the canyon to its present depth of a mile deep and up to 18 miles wide. Hurley says, “Of all the scenes in North America, I believe the view of the Lower Falls of the Yellowstone from Artists’ Point is the most striking.” The Lower Falls cascade from a height of 308 feet—twice as high as Niagara Falls. Hurley’s work is based on observation, but a canvas this large (5 feet x 8 feet) can’t be painted on site. He has an outdoor easel that lets him make smaller scale oil panels, and he also refers to photos and topographical maps to help visualize, for instance, the other side of a mountain. Hurley’s aviation background has a big influence on both scale and vantage point. The viewer’s perspective in Grand Canyon of the Yellowstone suggests the slow, low-level flying that Hurley enjoyed in his years as a military pilot. “It gave me a sense of proportion, an understanding of landscape, a familiarity with the surface of the world that a lot of people don’t have. [For Grand Canyon of the Yellowstone] I lowered our point of view 300 feet so the falls would look correct when viewed from the floor [of the art gallery] where the final painting is installed. Hurley changes the color of the trees as they get further away from the viewer. This is a classic technique to create perspective, or the illusion of depth, in painting.